QM12MP Multipurpose monitor is a combination high-output stage monitor/front of house speaker in a compact low-profile enclosure that features a number of thoughtful design features that will be appreciated by any professional who has had to face the challenges of fold-back under high pressure conditions. Functional as both a compact front of house or high powered stage monitor system, the QM12MP is available in left and right mirrored versions. Recommended amplifier power is a very respectable 500W RMS. Pole mounting and Aero-track fly-ware makes the QM12MP a very flexible addition to any audio production inventory. 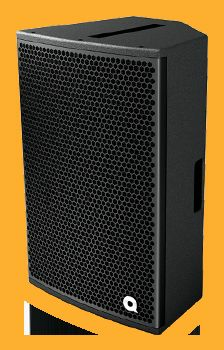 Great sound aside, the QM12MP was designed and built for the toughest live sound environments. A quick look inside reveals the components and build quality are extremely heavy duty in nature. The casing is high quality reinforced plywood with a structural supporting ring to hold the HF driver and add to casing strength. The high frequency driver is a large format 3” coil transducer capable of very high power. The HF driver diaphragm is a titanium alloy of heavy gauge which minimizes resonance at high SPL. The bass driver features cone geometry engineered to give deliver a particularly flat response when the QM12MP is functioning as a floor monitor. Recessed Speakon connector inputs protect connectors from accidental impact damage on a dark stage while steel reinforced neoprene floor runners help hold the box in position on a slippery wooden stage. As a final touch, the steel protective grill features a "singer proof" design fabricated in heavy gauge steel.